When United Nations troops are sent to an area affected by a natural disaster, they are there to help. But after the Haitian earthquake in 2010, many say these troops were the cause of a cholera epidemic. A catastrophic earthquake hit Haiti in January 2010 and killed more than 200,000 people, displacing over 1 million. 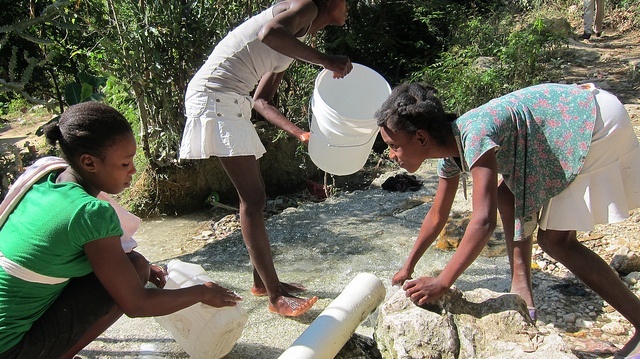 Ten months later, the Haiti National Public Health Laboratory identified cholera as the culprit behind a sudden increase in Haitians with watery diarrhea and dehydration. Officially 9,200 Haitians died from cholera, but a Doctors Without Borders study finds it could be higher, the New York Times reported in June. The cholera epidemic was a first for Haiti, the poorest in the Western hemisphere, which never experienced an outbreak of the disease. Cholera is a disease that if untreated can cause death in less than two days, but it is treatable with oral rehydration salt solutions, intravenous fluids or antibiotics. The main transmission method is ingesting contaminated water. After the outbreak began, rumors pointed to U.N. troops from Nepal as the source. The Haiti National Public Health Laboratory collected stool samples from cholera patients when the outbreak started and sent them to the U.S. Centers for Disease Control and Prevention (CDC) to analyze. What the CDC found is that a single strain likely caused the outbreak and was introduced into Haiti in one event. Something could have been done to prevent the cholera epidemic. A study released in January found that interventions “would have impacted the likelihood of the Haiti cholera epidemic.” Researchers concluded that screening, giving medications to prevent infection and vaccination are “all effective strategies to prevent cholera introduction during large-scale personnel deployments such as that precipitating the 2010 Haiti outbreak." In 2013, a federal lawsuit was filed in the Southern District of New York after prior claims against the U.N. demanding accountability for the epidemic were ignored. The claims demanded that the U.N. take steps to prevent another cholera epidemic by installing a national water and sanitation system in Haiti. Complainants also demanded the U.N. provide compensation to cholera victims for losses and issue a public apology. The U.N. maintains that it is immune from lawsuits, including the federal lawsuit. Hopefully that new response will begin to undo the damage caused by the cholera epidemic. The Haitian people have suffered enough.